If we can not find you, we can not help you in an emergency when every second may count — especially at night! Unfortunately, emergencies can and do happen and when precious seconds can mean the difference between life and death, you want to be sure you have done everything you can to put the odds in your favor. The Easton Volunteer Fire Department is making available to the general public, Reflective Address Signs. These signs that are constructed of high strength durable aluminum and measure six inches by eighteen inches are covered with your choice of a highly reflective Green, Blue, Red or Brown background or a non-reflective Black Background offering a high contrast. The signs are individually personalized with three inch white reflective bold numbers on both sides. 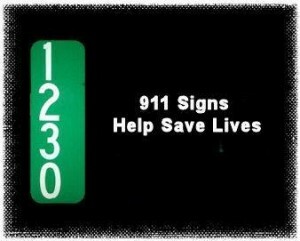 These highly reflective, double sided and very visible signs help emergency personnel find your home quickly in the event of an emergency. The signs are $20.00 each and the proceeds of this project benefit the Easton Volunteer Fire Department. Easily installed on mailboxes or wooden posts. If you live on a driveway with multiple houses or structures, you should consider a second sign that will identify your location. We can also assist you by having our personnel install the signs for you at the entrance to your driveway. Note a post will have to be provided near your driveway entrance if your mailbox is not in the proximity. Support your local VOLUNTEER Fire Department by purchasing a Reflective Address Sign for your home today.